We arrived at Shanghai Airport in Pudong at 12 midnight. The airport is massive with 200+ departure/arrival gates. 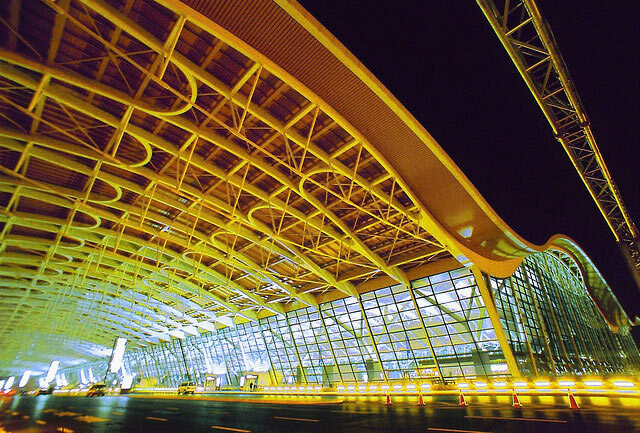 It was quite advantageous for us to have arrived in Shanghai Airport in the wee hours of the morning. Immigration queue and baggage claim was pretty fast since the arrival area was quite empty. As usual, we took city travel maps before heading out of the airport. We would love to experience the Maglev train ride from Shanghai airport but it was already outside its operational hours. We took a cab to the city center instead. The taxi area in Shanghai Airport can be spotted easily since all signs in the airport are both in English and Chinese. We also found plenty of cabs in the taxi bay even at midnight and queue was very short. Taxi is Shanghai is safe and cheap. But be ready to brace yourself for super fast crazy ride. Our taxi sped in the expressway beyond 120 km/hour which made us cling hard to our seats for our dear life. In about an hour, we reached our hotel in Puxi. Taxi fare from Shanghai airport costed us about RMB 220.00 (~USD 35.00). It is important to be aware that Shanghai cab drivers do not understand English. Anticipating this to happen, it’s a good thing that we have printed out the Chinese names of our destinations before we departed for Shanghai.